One afternoon last week it was lightly raining when the sun came out. That being perfect rainbow weather, I grabbed my camera and ran outside hoping to see one. The rain had mostly stopped when I got out there, so no rainbows. But I did see this awesome little frog hopping around in the backyard. 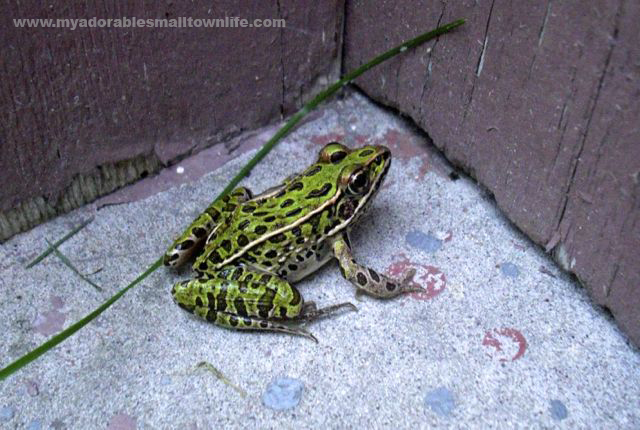 He spent some time in front of the garage door, before he hopped along onto some very important frog business. Thank you! I love this photo. Did you ever see that special about cane toads? Not that this is one, just reminded me of that show. No I never saw it.